This is the controller for the SC-1022 Carson Mechanical siren. This is the CONTROLLER ONLY. 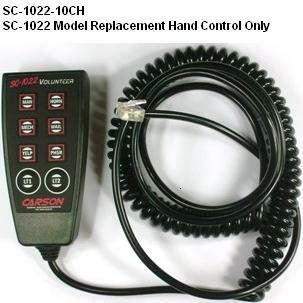 Do you have a Carson SC-1012, if so, you can turn the SC-1012 into a SC-1022 Simply plug this controller into the SC-1012 and it then has all of the function of the SC-1022. With a coiled stretchable cable, you can place this remote in a non obstructive placement in your vehicle. Then, when you are ready to activate, simply choose your siren tone then activate your lights. To install, you simply plug the end of the cord into the siren amplifier and begin using the product. It's really easy! The biggest benefit of using the controller vs. the switch control panel occurs during installation. The wiring that is required from the box to the switches is eliminated with this product. It's worth it! Questions? Call us - we are here to help!